Adventure River...it's an ocean of fun! Adventure River...fun for everyone! Adventure River...we're making a splash! Summer's never been so much fun. Adventure River! 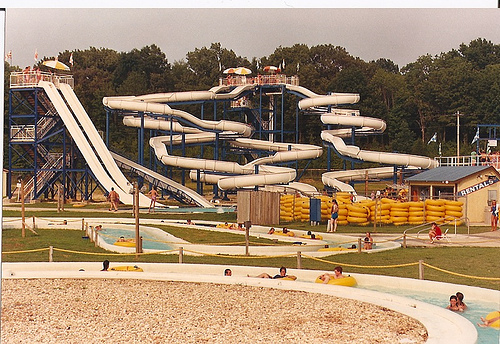 Adventure River was a water park located in Memphis, Tennessee, on the north side of Interstate 40, near Whitten Road. It opened in 1981 and closed in 1998. 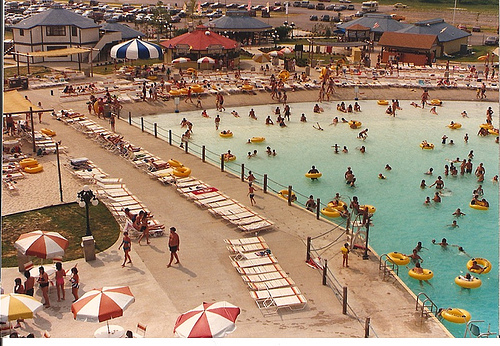 Adventure River included a beach, a wave pool, concession stands, and several water slides. The most well known slide was named Geronimo. 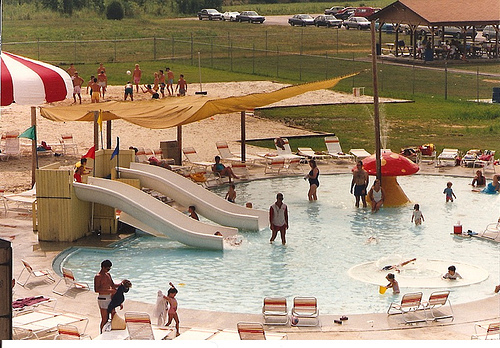 The park featured live music concerts, including many local musicians and "Dive in movies", which patrons could watch from the wave pool. It was open from Memorial Day weekend through Labor Day weekend each year. Other attractions included several small rides in a kiddie area. Adventure River, which had become in its later years "Wild Water and Wheels" with the addition of go-carts, was closed in September 1998 due to decreasing attendance, rising insurance costs, and the rise in property value in the area. It leaves to wonder that if more was done, could Adventure River still be afloat? If only they looked into free insurance quotes, and possibly marketed more, could they have gotten the water park back on track, to succeed through the rising property values. Apparently. its not always that easy, but it would have made for some continued summer fun, had Adventure River stayed open. Much of the land formerly housing the park is now used as an industrial park which houses regional offices for Johnson Controls, Terminix, Burger King and Trugreen among others. 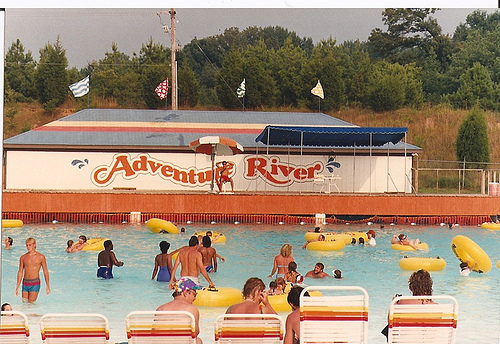 Adventure River was known as Wild, Water, and Wheels in its later years and is the only waterpark that I can remember in the Memphis area. It was located on Whitten Bend Cove, off of Whitten Rd. and I-40 in Bartlett. They had the usual waterpark fare, a "lazy river," a wave pool, assorted slides, concessions, and I think they may have had some sort of bumper boats or some such, but i'm not sure about that. 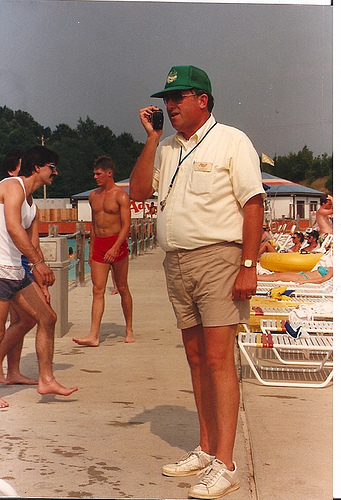 As I think back on it, it doesn't make sense that a waterpark was located so far from Libertyland when they would have been mutually good for one another had they been close together. Even better would be if they had been owned by the same people and run as a unit, similar to what Six Flags does with their parks here in Arlington, TX. All in all, it's understandable why the park failed, since Memphis seems to have trouble supporting their entertainment venues, but one thing you can't blame for its failure is its poor surrounding areas. I have looked and looked but can't seem to find any information on the place. All I can find is that it was shut down for good in 1999, and it's now a retail area. Any memories or pics you may have of the place would be cool to see. The area around Adventure River was much more remote in the early nineties. The huge multi-lane bridge at Whitten over I-40 today was then an old, narrow two lane bridge that would usually elicit a cringe should you pass another vehicle while on it. It seemed very narrow to new drivers, especially. Whitten Road itself was also narrow with little business community of its own and lots of inexpensive lots with trees, etc. Because of the nearby residential communities in solid middle class neighborhoods - it likely seemed an ideal place to build a summer water park. In fact it was very popular with moms - a perfect easy treat for kids during the blistering hot Memphis summer days. For some reason, even though I lived just a few miles away, I never bothered to check it out. I was in the minority. 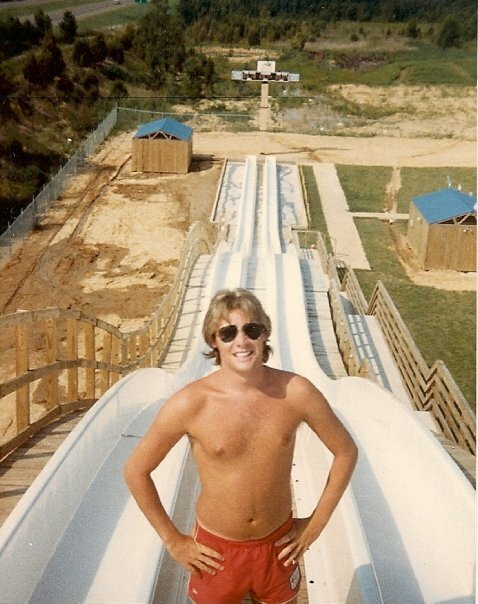 Actually, there was another water park...sort of. 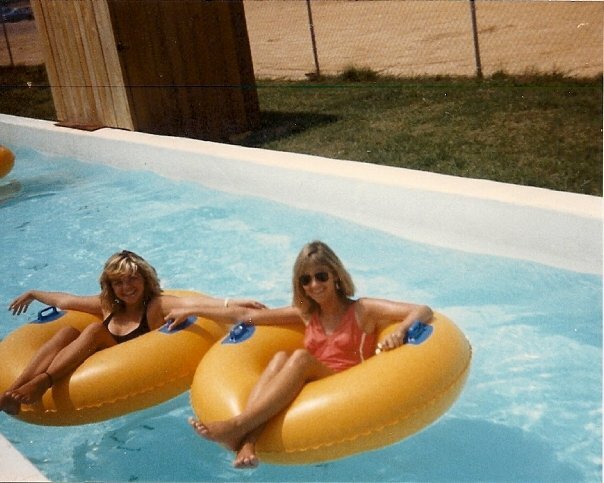 There was a 3-slide water slide at the Putt-Putt at Summer and Bartlett from about 1979 to 1985 or so. It was very well known at the time because it collapsed I think in 1979, injuring a bunch of people. It stayed open after that, and I remember the times I was there on summer weekend nights and days there was a huge crowd. Ed. note - One young girl was permanently paralyzed as a result of injuries she sustained in the collapse of the slide. Memphis was still a small enough town that it was not uncommon to see this girl and her family around town in later years, at shopping centers, etc. She remained wheelchair bound. Later, around 2002-2003, during high school, I would spend time near an old mansion just up the hill from the old place, which by then had turned into a headquarters for "pyramid electric." My friends and I eventually went back to the area as they first started to build things there, and noticed the remnants of the pools and such.. the depressions were similar to the Ice Chalet area at the Mall of Memphis site. Interesting to note, as it is related, is that Hillshire appeared to never be finished: the whole incomplete area is now being developed into commercial, however, I used to spend much of my time in the forested areas past the water park site, and the "mansion" as we called it. The mansion and almost all of the forest have been torn down in the past 3 years, to make way for the new commercial development... honestly saddening me, since the forested area was quite important to me... like so many other areas..
Oddly, even tho my family lived by the water park for all those years, we NEVER WENT THERE ONCE! I know, it sounds odd... but I guess that's what happens when you lived near something.. you think it will be around forever. Just like the Mall of Memphis, so went Adventure River / Wild Water and Wheels, I guess.